Kelsey Weekman was getting bored by Facebook and Twitter. As the online managing editor at The Daily Tar Heel, she uses social media to distribute the stories of the University of North Carolina student newspaper. But after using the same channels for years, crafting posts for social media started to feel stale and formulaic. "The free-flowing newsletter formats allow outlets to experiment with content, take chances and try new things." And then, the daily email newsletter theSkimm took off in popularity among her peers, as well as in other campuses. theSkimm was able to reach a younger audience by summarizing big news stories – everything from ISIS to Fed rates – using an irreverent, friendly tone that was easy to skim, as the name suggests. For Weekman, email allows her to go beyond the 140-character limit or the whims of the Facebook algorithm and write more freely and openly in a longer format. But the appeal of email isn’t just limited to a retro novelty, like the vinyl records of digital distribution tools. It makes a real difference in the site’s metrics. Since launching the Daily Tar Heel’s daily newsletter, Weekman has observed a few hundred more clicks per day to their site compared to the previous year. Using the newsletter service Mad Mimi she can see what’s been accepted, bounced, viewed, engaged with, shared and forwarded. It’s early in their experiment, but they’ve already managed to build a buzz and get positive feedback from students – as well as other news outlets. “Probably the best measure of success is that other college media outlets asked if they can copy and learn from us,” Weekman said. It may come as a surprise that today news outlets are asking a 21-year-old for advice about email. Is it 2016 or 1996? But email newsletters aren’t just an experiment in college newsrooms. Over the last few years, several news apps have come and gone, including Circa, Zite, Trov and Pulse. But email has persisted. Over the weekend, entrepreneur Jason Calacanis announced that he was joining the group of shuttered news apps and pivoting his Inside.com service to the tried-and-true. He’s not alone. Email is an integral strategy for driving traffic even at cutting edge social media-driven sites, such as BuzzFeed. 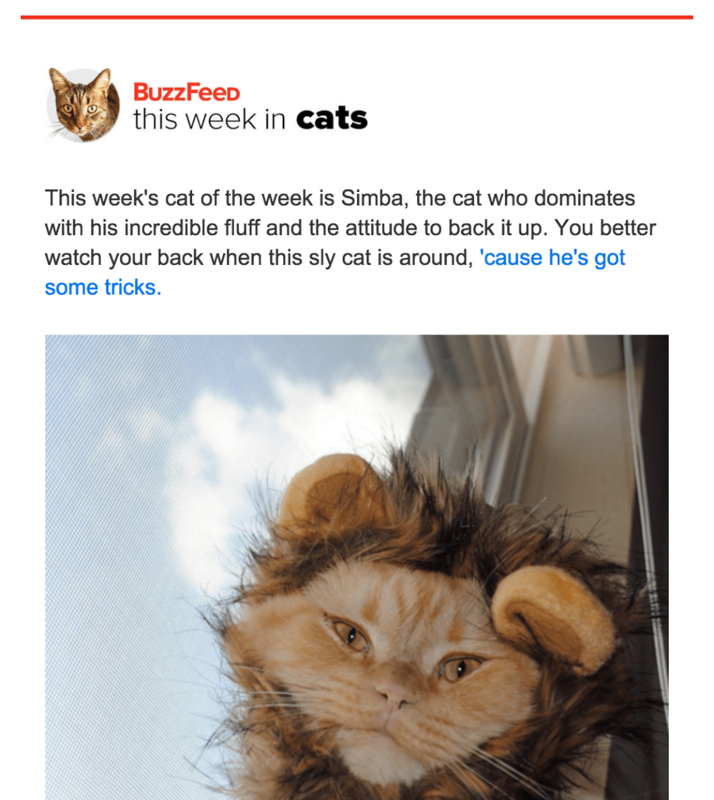 Currently, BuzzFeed has 12 email newsletters that range from weekly (This Week in Cats) to weekdays (BuzzFeed News) to daily (BuzzFeed Today). Nick Andersen, associate producer On Point Radio, obsessively tracks the email newsletters from Politico. He uses them in his job as a producer — to book guests and track political opinion and news items — and as an avid news reader to stay up-to-date on what’s happening in national politics. Calling on his love of Politico’s email newsletters, he launched the first newsletter for On Point Radio. The concept was simple: Have news analyst Jack Beatty, who lives in New Hampshire, write up all his thoughts in a newsletter leading up to the state’s primary. Using the attention from the high-profile election, they could then migrate the subscribers to a list with content about their shows. Andersen created the newsletter with MailChimp “out of a desire to avoid Constant Contact” even though his station had a full version of that software. He enjoyed using MailChimp’s templates, plug-ins and list building tools. If email is undergoing a renaissance, then MailChimp is its Michelangelo. The email newsletter service gained notoriety as the sponsor of Serial (Mail…kimp?) and today sends out more than 600 million emails per day. MailChimp has endeared itself to media outlets by focusing on content creation, and not just e-commerce like other email service providers. It also offers the first 5,000 subscribers free as well as another free minimalist service called Tinyletter. 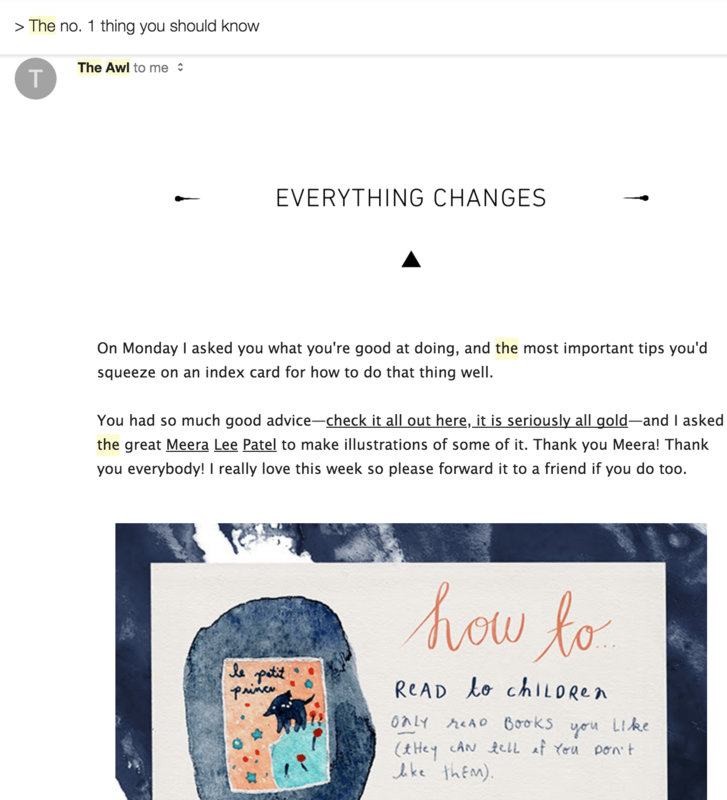 Full disclosure: I have my own MailChimp newsletter and weekly Tinyletter, which I use to aggregate and send what I’m reading and writing to friends and readers. Andersen also runs a side newsletter about bears, called IMPORTANT BEAR NEWS. The free-flowing newsletter formats allow outlets to experiment with content, take chances and try new things as they grow their list. The extreme version of this is the Awl, which changes its format each newsletter. Andersen sees newsletters as a slower, more thoughtful alternative to the frenzy of social media. When clickbait and sensationalism can often overtake news feeds, email can succeed for media companies by providing a throwback to a message that feels more intimate and authentic. “We imagine (hopefully) that if our listeners have time to listen to our two-hour daily broadcast, they might have time to read a quick note from our host, our news analyst, or our production staff on a related topic,” Andersen said. Weekman, the online managing editor at UNC, has become so interested in the newsletter format for media that she is working on an independent study project on the topic. On her website, she analyzes email newsletters from different media outlets, such as The Atlantic, the NYT Morning Briefing and BuzzFeed News. Her analysis also, of course, comes in email newsletter form. Voice and tone matter. If people don’t like how your newsletter sounds, or they think it’s too casual or too complicated, they won’t subscribe. There are endless possibilities for layout — bullet points, lists, even quizzes and user comments. A particularly tantalizing or silly subject line gets a higher open rate. Big news and business stories always get clicked on. Links, links and more links. Link to any story that could help the reader understand a concept, whether that is separate from your publication or not. 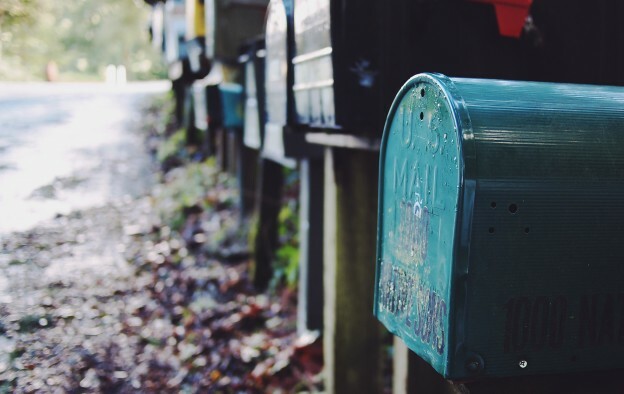 Finally, stand-alone newsletters can be very successful. TheSkimm has a sponsor for every email and they link to other outlets, while the Charlotte Agenda broke off from the Charlotte Observer to pursue a newsletter-centered business model that has sponsors, paid job listings and other creative advertisement spots. Analyzing other outlet emails has only grown her enthusiasm for creating her own newsletters. After focusing on increasing subscribers, she now switched attention to open rates and engagement. She’s also invited feedback from readers to refine their offerings. That keeps her going when she has to put together a daily newsletter on top of her regular social media posts.